Dubbed phenomenal by the club’s supporters, Andy Smith has been a revelation in Gillingham since his first appearance back in 2004/05. In the decade that has followed the 29 year old forward has lit up the Silver Blades to make more appearances than any other Dynamos player, score more goals than any other skater and claim more assist than anyone else to ever don the Mos jersey. His record of finding the net 483 times whilst playing a hand in 462 more leaves the number 26 just 55 points shy of the 1000 landmark going in to the new season – a campaign he enters full of confidence after being selected as the club’s Forward of the Year last term. 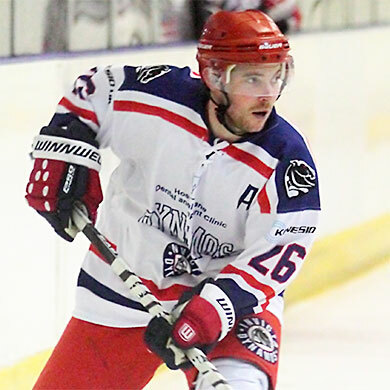 2013/14 was yet another successful season for Smith who, despite returning a month after the first puck drop, was an inspiration once more with a further 41 goals and 50 assists seeing him add another 91 points to his tally. He will now be looking for more of the same in 2014/15 where he will once again spearhead the team’s attack and prove a vital component in the Dynamos line-up. “I have been fortunate enough to re-sign Andy year after year after year and each time it becomes harder to summarise what a player of his quality brings to the ice. His statistics are outstanding, his effort is remarkable and his commitment is unquestionable. There isn’t a club in this league that wouldn’t sign Andy Smith if given the chance and I consider us very fortunate that the Dynamos is the team he loves. To borrow a phrase from our supporters, Andy’s return in front of goal is simply phenomenal and if he could hit that 1000 mark this year it will be a testament to player who has been consistently brilliant for a decade. It means a lot to him to wear that Dynamos logo, he’s a local lad turned local hero and I look forward to having his drive and determination back out on that ice again in 2014/15”.